Lots of little jobs to do. The trailer not the least of them. While its in pretty good shape, it looks as though it was a power boat trailer set up for a deep vee power boat, and its not quite right in several areas. 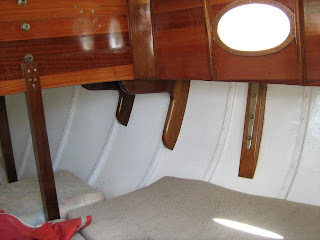 You'll note that there is no self centering system on the keel rollers, that has to be fixed, I'm thinking of mounting a 3m piece of 45 x 195 bunk with astrograss on it, one each side of the keel just above the rollers so the keel will slide up between them staying in the middle of the rollers. I can put a rubber tyred wheel horizontal each side at the entry point to guide her in, and with luck I'll be able to haul her out onto the trailer myself. Thats a good start, the winch will get a spectra cord winchrope, the bearing buddies will be checked to ensure that the bearings are ok ( just done that ) and the winch mounting needs some attention as well. A jockey wheel came with her, and thats got a broken winding handle mounting block so cant be used, more work. A view of the cockpit, those locker tops have hinges on the side ones but no catches, and the ones aft under the tiller have neither so there is some thinking and some work to be done there. The cockpit is very comfortable though. Starboard side bunk forward end, that metal strap is the chainplate and the post to the left is the mast support. Almost out of sight forward of that is the samson post. Most of the varnished wood in here is eucalyptus of some sort, looks lovely, especially by lamplight. The galley, at the head of the starboard bunk it slides in under the bridgedeck when not required. I will have a look around and see if I can find a simple camp stove that will fit in the space on the right. 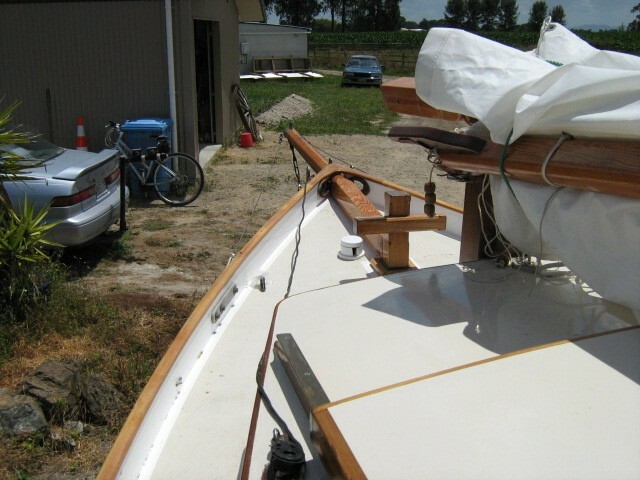 ALthough its hard to make out, the white wall on the right of the pic is the daggerboard in its up position, its a visual barrier but does not actually get in the way. The boat sails pretty well without it but I'm told it points the boat up about another 5 deg in light and moderate conditions, I'll try it and see. Note the nice little bulwarks, makes the side decks much more secure to walk on. Thats both unusual and very nice on an 18 footer. I did have a win today, I'd been concerned that the boats new rudder post was binding making the helm extremely stiff, and attacked it today to see how the bottom bearing was secured in order to drop the shaft to see what would be required to free it up. I figured that some lubrication would be helpful in sliding that post out down the rudder casing, so poured some heated marine grease down there and waggled the tiller for a while to spread it around. After about half a dozen push and pulls on the tiller the movement became nicely free. No more work required, whew, thats a big job that I wont need to do. 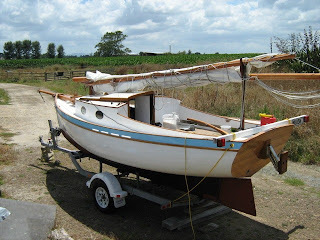 I'm aiming at next tomorrow for a test sail on a local lake, while the lake is not big the Waikato Trailer Yacht Squadron have race days there so its big enough to accommodate an afternoon sail without getting bored, has a good boatramp and is open enough to allow the breeze in. I've been out and bought a second hand whistling kettle, a big melamine ( unbreakable plastic) mug, and a Thermos flask, thats just for lunchtime tomorrow and I'll finish outfitting the galley with a bit more gear from the op shop next payday. Tomorrow, think of me out on the lake, nosed up to a bank of rushes with the trees overhanging, in bright sun and perfectly calm water puttering away adjusting the lacings on the sails or the jib sheet angles while awaiting the whistle of the kettle. And thats all from him, and thats all from him. So when I was in the local Bunnings store ( its about the same as Lowes or any of the other big box nightmare hardware stores) and I saw a specials box with bundles of good looking 10mm ( 3/8in) braided rope in it, I looked. Rope, expecially that sort of size and looking like yachtbraid? Well, there is always a place on board for that. Gaff rigged boats use LOTS of rope, in fact I think anyone owning a big gaff ketch will just about need to buy a rope factory to go along with it. Anyway, the price on these 30 metre ( 100ft) lengths was amazing, only NZ$8 90, ( about US$6 00 or so). At that it was never going to be the real deal, the good stuff, but how bad could it be? The colour for starters is not what you'd want to see on a traditional gaff rigged classic, but maybe it could be used as a dinghy painter, or to tie up to a jetty, or just as spare. I bought two, brought them home, and peeled the outer cover back to see what was inside. Ahah! The core is not braided, its a bundle of split fibre, just an extruded strip of plastic about 50mm ( 2 inches) wide which has been rolled laterally into a round bundle, and the cover woven over it. Thats not an automatic disqualification in itself, but it does mean that when the rope is under load there will be a strong tendency for the core to slide within the cover, bunching the cover and locally stressing the core. it also means that its prudent to put a whipping on the ends of the rope to prevent pulling the core through the cover and away from the end. I'd say that just melting it together as is the usual practice wont be enough, so put a whipping on it, and stitch the core to the cover with a needle and heavy thread. I dont think the usual 8 or 10 times through will work in this case, try 20 or so passes with the needle then a 50mm whipping over the top. Next, I put the end of the rope in a flame, each different type of fibre has a distinctive way of burning , or a particular smell and this is not the high strength polyester or nylon rope that yacht braid is usually made from, it melted at a very low temperature, burned very easily rather than just melted and did not smell the same as my samples of either polyester or nylon braid. It did though smell much the same as some cheap packaging twine that I think is polyproplene. Here are some clips from a site which gives the properties of rope fibres. Polyester looks and feels much like nylon, however, it has considerably less elongation and does not have increased elongation when wet. 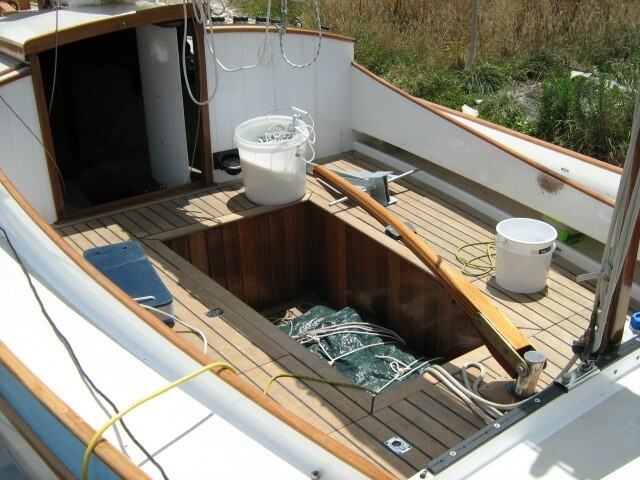 Polyester ropes are unaffected by water and are impervious to rot and mildew. They are more resistant to acids, but are sensitive to alkalis. Polyester is naturally quite UV resistant. Its melting point and performance at elevated temperatures are comparable to nylon. Polypropylene is the least expensive of the common rope fibers. It is very light and therefore is often used where floatation is required. It is unaffected by water, and generally has good chemical stability. However, it is considerably weaker than nylon and polyester, and tends to deteriorate rapidly from UV radiation. Polypropylene ropes have a low melting point, and tend to exhibit high creep (gradual elongation under load). You can see that Polyester is very good stuff for everything yachting except anchors where some stretch is a help in absorbing shock loadings, and polyproplene is not much good for anything except tieing up a horse. A small one at that. It looks and feels nice, but be aware, dont get caught. Its only 3 weeks until the big regatta at Mahurangi about 25 miles north of Auckland. I've only missed the event about three times in almost 30 years, and really do want to be there with May this time. I'm normally there on the beach and race as crew in whichever boat is offering a space, usually in a boat of my design and its fun to sail in someone elses interpretation of my plans. People do things in lots of different ways and although I've been designing boats for many years I am very much open to new ideas. That plus meeting my customers is one of the really good parts of the job. But this time, I'll there with a "big" boat. Big in the sense that at about a ton and needing mid thigh deep water she cant just be hauled up the beach. Big too in the sense that as our tides are between 3 and 3.8m ( 10 to 13 ft) she'll need to be anchored out in water rather too deep to walk ashore. So, I'll need a dinghy. I'll start drawing one up, will begin making frames this afternoon, will call in at the hardware store tomorrow and see what they've got in the way of cheap plywood, and by next week hope to have the wee boat done. Criteria, light, carry two, tow well and dry, fit in Mays cockpit when the boats on the trailer being towed to wherever I am going sailing that day. Cheap and quick to build. On the other front, I went out on friday to buy a wick for my nice kerosene lamp. I like to read of an evening and May has no electrical system, so the big gymballed cabin lamp that I found in a junkshop years ago looked like just the thing. Its got a wick about 30mm across, a smoke bell for overhead, and a reflector to make it more effective. But, a new wick was $28.20. Would have taken two weeks for the shop to get it in, and I'm not sure that I'm going to pay that. Or wait that long. Next stop the supermarket for the weeks groceries. On Special, a compact camping lantern, battery powered with 4 AA batteries, supplied in the package. Xenon bulb with diffuser, hook for hanging up, shockproof. $10.45. Its not "marine" but if previous experience is anything to go by, it will last several years before rust kills it. I bought two plus an LED torch ($5.80). Not as romantic, but if its romantic that I want I can read a book on tropical cruising. The jobs done today have been, as before, in between other things on the house, but its my birthday and my lovely wife bought, in addition to a new pair of Levis and a fancy knit shirt, a bg grey tarpaulin to use as a boat cover. Its a long time since I had a boat, family, the dayjob plus the design work, building a new house and workshop, and all the usual committments and distractions of life did not leave much time to go sailing. But its easing up now, the design work is now the dayjob, sometimes I'm doing tech work in the heavy wood processing industry but thats only sometimes, the house is almost done, the workshop and office ditto, so there is time for sailing. I've about rebuilt the outboard motor bracket, it was originally set up for a short shaft motor, but both the Tohatsu 3.5 that came with the boat and the 4 Hp Yamaha that I've got stowed away waiting for the right boat are longshaft motors. I've pulled the bracket off, moved it up about 70mm and padded it out some. I've also made a new motor pad that moves the motor out 25mm and up a further 30mm. 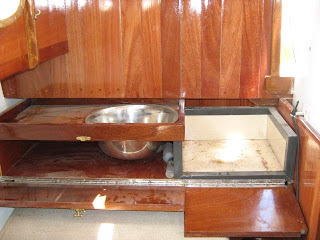 As it came to me the motor mount meant that when in the water it was very difficult to reach the motors controls plus it was too close to the transom which made things even worse. The new position will be much easier to access and the motor in about the right position with reference to the water level. I'm off to EDL in the morning, I'll tell you what they cost from there. Been there, talked them into trade price, 38c each, plus another 12 c for the nut and washer. 50c each, minimum quantity one, I bought a box of 50. Thanks EDL, branches throughout NZ. Jobs done, fixed the tiller, it now sits at the right level rather than having to be held there, changed the jib sheet turning blocks so I'll have a two part purchase on the sheets, soaked the trailer winch wire in a mix of oil and kerosene for three days and its now looking a lot less rusty and tired. Also made a block which fits into the mast step, to support the forward end of the mast when trailering, that allows me to have the mast and boom far enough forward to not have any overhang aft, and no hassles with special warning flags. She's all untidy right now, little jobs being done all over her, so there is gear and tools lying around, and nothing is properly stowed away. Bought new lithium batteries for the camera, no way of getting a discount on those I'm afraid. But they last pretty well and I've now got a spare set so here are some more pics. Well, theres a bit of learning to do here, this system only seems to want to upload one pic per posting.